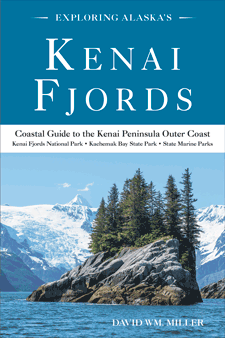 The Kenai Fjords National Park (KFNP) comprises a major portion of the Kenai Peninsula outer coast southwest of Seward. Northwestern Fjord, a mayor embayment in the KFNP, lies 45 nm southwest of Seward. Northwestern Fjord (right) is where the Gulf of Alaska invades the glacier-sculpted Kenai Mountains. In total, eight major glacial fjords fall within the KFNP boundary. Northwestern Fjord is the most spectacular fjord on the outer coast. It is well-protected by its shallow moraine bar, which blocks the violent storm waves from funneling into the fjord. 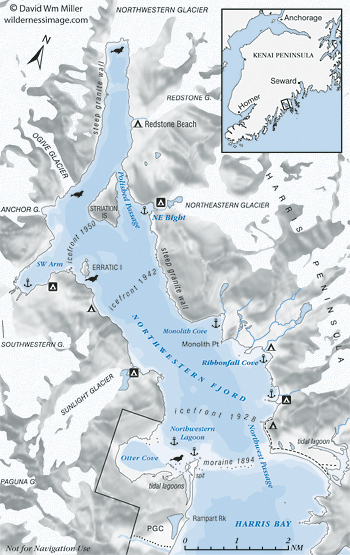 A boater or kayaker could easily spend a weekend or more exploring the glacial basin. As recently as 1909, when it was first surveyed, most of Northwestern Fjord was buried under a thick layer of ice. If you only have time to visit one place in the Kenai Fjords National Park, Northwestern Fjord (map at right) is the place to visit! 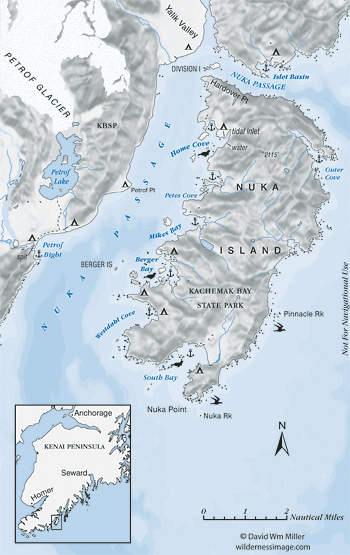 Nuka Island (Kachemak Bay State Park) is wild and remote. (Map Below). The island is 70 nautical miles southwest of Seward and there are no services in the region. Nuka Island's western shore provides several excellent anchorages and a dozen easy to access camping areas. Nuka Passage is a wonderful place to explore. Nuka Island is one of the least visited locations on the outer coast. The island is the largest on the Kenai Peninsula outer coast and is a part of the Kachemak Bay State Park. A handful of indentions along the east shore of Nuka Passage, including Home Cove, Petes Cove, Mikes Bay and Berger Bay, are sheltered from gulf coast storms waves. In mild weather, all the coves on the island's west shore are hospitable spots for a base camp or for waiting out foul weather. Caution: Nuka Island's western shore is shallow and rocky. The tidal inlet at the head of Mikes Bay goes dry at low water and should be avoided by vessels.